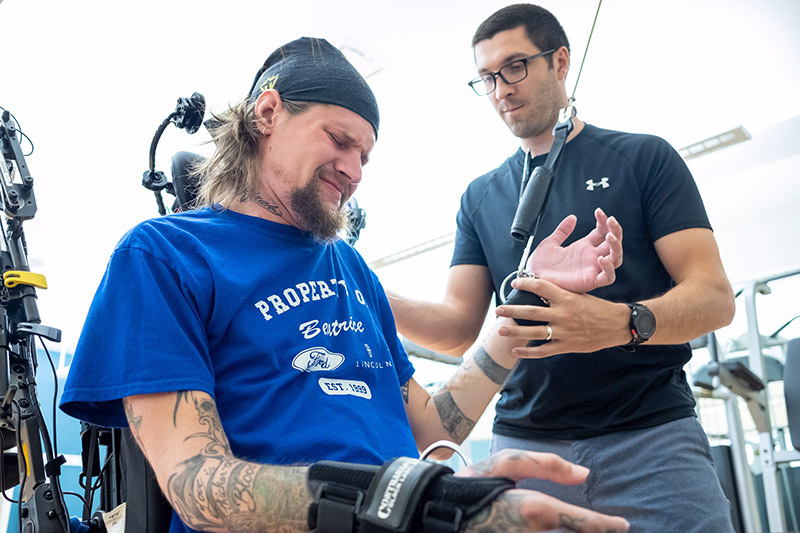 A collaboration between the Division of Biomechanics and Research Development and nonprofit QLI (Quality Living, Inc.), a post-hospital center for brain and spinal cord injury rehabilitation, has led to three initiatives which are benefitting individuals recovering from traumatic injuries and strokes. QLI resident Boston Bieler (left) with Coordinator of PT/OT Services and Physical Therapist Brad Dexter. During his rehab, Bieler benefited from a QLI-prototyped, Biomechanics-revised mobile arm support device. Photo credit: Jon Pearson, QLI. Machinist Travis Vanderheyden, Assistant Professor of Biomechanics and Machining and Prototyping Core Director Dr. Brian Knarr, Assistant Professor of Biomechanics Dr. Jorge Zuniga, and Graduate Assistant Drew Dudley are part of the interdisciplinary UNO team working closely with nonprofit rehab facility QLI and their residents. Vocational rehab training participant Shane Hultine (center) with Dr. Brian Knarr (left) and Travis Vanderheyden (right). Photo credit: Jon Pearson, QLI. Omaha – "I’ve always been a fighter, and I’m still a fighter," explains QLI resident Boston Bieler. "I’m fighting to get back all I can." 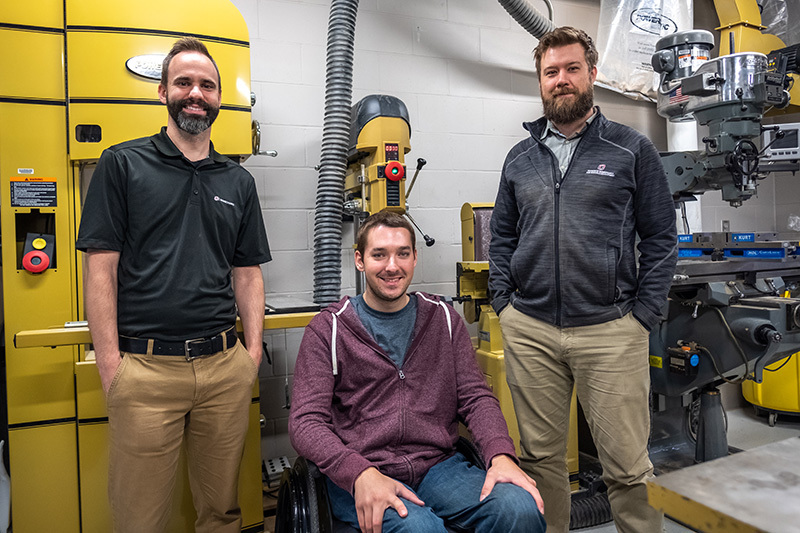 Bieler, who suffered a severe spinal cord injury from a gunshot wound in March, has regained greater use of his arms with help from an assistive device—a QLI prototype—that was redesigned and improved upon in the Biomechanics Research Building (BRB). "When I first got to QLI, I was completely paralyzed. The mobile arm support helped me strengthen my arms. It’s kind of like a crane—it held my arm up in a sling so I wasn’t fighting gravity. I could move left or right, side-to-side depending on the tightness. I could lift my arm up and push down. As I got stronger, I found different ways to angle it to work my arms. Now, I no longer have to use the mobile arm support. It has allowed me to be more independent. Without it, I’d need someone to go with me everywhere." Design and Fabrication of Devices, Parts | The QLI-prototyped, Biomechanics-revised mobile arm support device being assembled by Todd Schmitz, QLI's Adaptive Repair Technician. Photo credit: Jon Pearson, QLI. 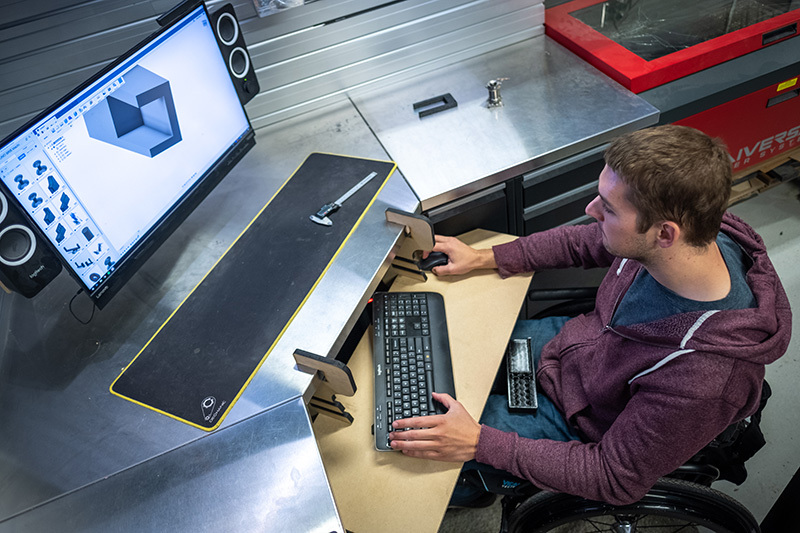 Bieler’s mobile arm support is one of over 200 devices and accessories that have been developed—with QLI’s involvement—in the BRB’s Machining and Prototyping Core Facility over the last year. Through this initiative, assistive devices and accessories are custom designed and fabricated in the BRB’s machine shop based on the unique needs of QLI’s residents, therapists, and clinicians. Broken components are also replaced and new tools are designed and created to enable more effective treatment. QLI pays UNO for these services. 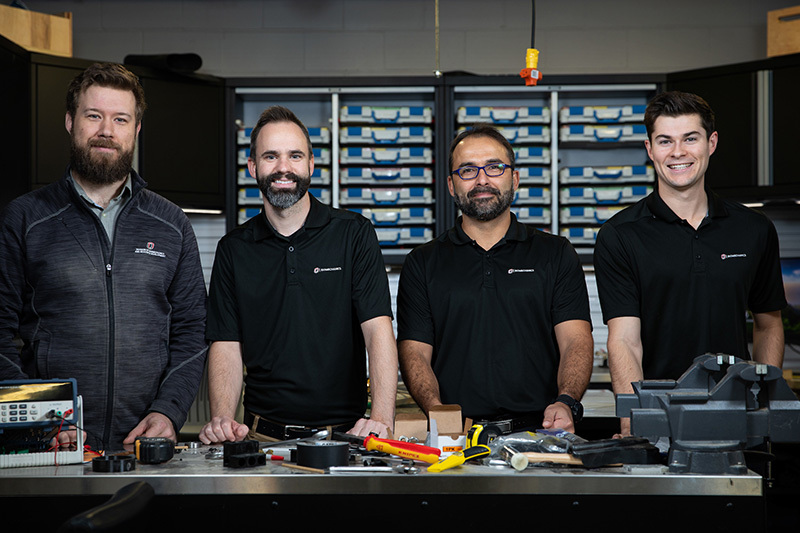 The Machining and Prototyping Core Facility, run by Assistant Professor and Core Director Dr. Brian Knarr and machinist Travis Vanderheyden with support from UNO student workers, is the first service center on the UNO campus. A service center is an area that charges for services to support internal or external research objectives. Establishment of this service center was a component of the recent submission for the National Institutes of Health's (NIH) Centers of Biomedical Research Excellence (COBRE) Phase II grant funding. 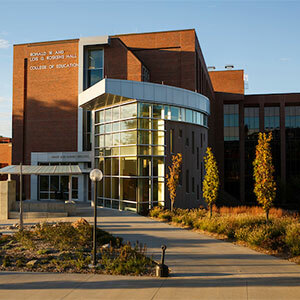 Additional support for the service center has been provided by the Nebraska Research Initiative. Robust collaborations with regional research communities—like the partnership with QLI—will help the Core achieve its goal of independent financial sustainability. According to Dr. Knarr, "Our hope is that the Machining and Prototyping Core Facility is a resource for UNO and the community through our development of new and innovative devices to treat and prevent movement related disorders." Exoskeleton Hand for Stroke Rehab | 3D-printed prostheses technology is utilized to create these low-cost, customized assistive devices. The exoskeleton helps stroke patients extend their affected hand. The partnership between the Biomechanics team and QLI began in 2016 when a donor with an interest in stroke recovery reached out to Dr. Knarr and connected him with QLI. Dr. Knarr used his background in stroke rehabilitation research to assemble a team of specialists who began work on their very first initiative: an affordable and accessible upper arm stroke rehabilitation tool. The interdisciplinary team, guided by Dr. Knarr, is developing this rehabilitation tool with input from the occupational therapists (OT) at QLI. Efforts to expand the collaboration to clinicians at CHI Health Immanuel Rehabilitation Institute and Madonna Rehabilitation Hospitals are underway. The tool consists of two components: an exoskeleton hand utilizing 3D-printed prostheses technology from Assistant Professor Dr. Jorge Zuniga and collaborator Jean Peck, OT at CHI Health, and a virtual reality (VR) system developed by Assistant Professor Dr. Brian Ricks’ team in UNO’s Department of Computer Science. "In the BRB, we are designing a 3D printed exoskeleton to help stroke patients extend their affected hand. Many exoskeletons can be difficult to acquire or are unable to leave the lab they were built in. This exoskeleton is inexpensive, custom made for each patient, and is easily accessible as it is 3D printed in the Biomechanics Research Building," explains Dr. Knarr. "The exoskeleton uses elastics to extend the patient’s hand and has dials to tighten or loosen the tension. 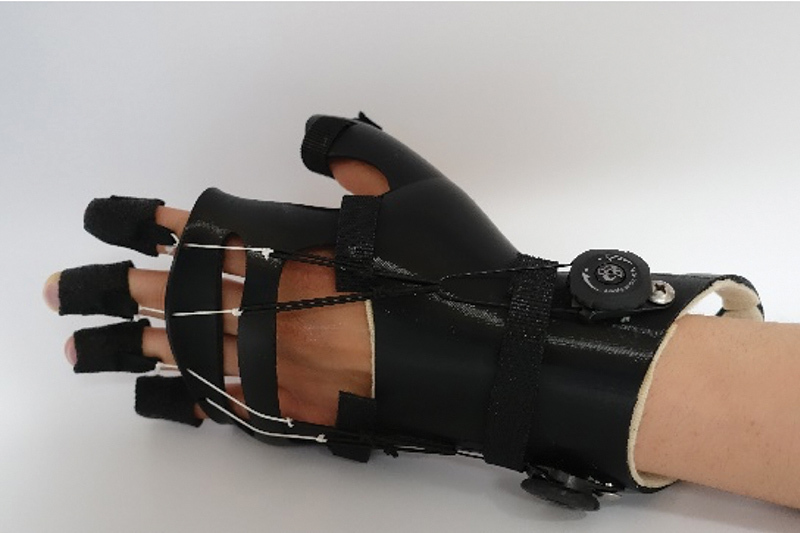 The goal is that this exoskeleton will help the patient use their affected hand in their own environment to grasp objects and improve mobility of their affected hand over time." For the VR system, Dr. Ricks’ team has designed several games for stroke patients, translating the rehabilitation experience into a virtual world. These exciting virtual settings mimic real-world situations and provide variation of traditional rehab methods. Benefits of gaming-style VR environments for stroke recovery patients include positive feedback of performance and assessment allowing for real-time adjustment, and a reward system which increases engagement and motivation. Eventually, the two components will work together, allowing for a totally customized experience for stroke recovery patients. According to Dr. Knarr, "This is a system to be used by clients and therapists. During the research development phase, it’s important to have a dialogue with our end users so we don’t develop in a bubble. We have clients using prototypes of our exoskeleton hand and VR environment in both academic and therapy settings, and we are improving our designs based on the clinical feedback. Once we systematically understand all the components, we will put all the pieces together to get a better rehab tool in the hands of clinicians and their patients." 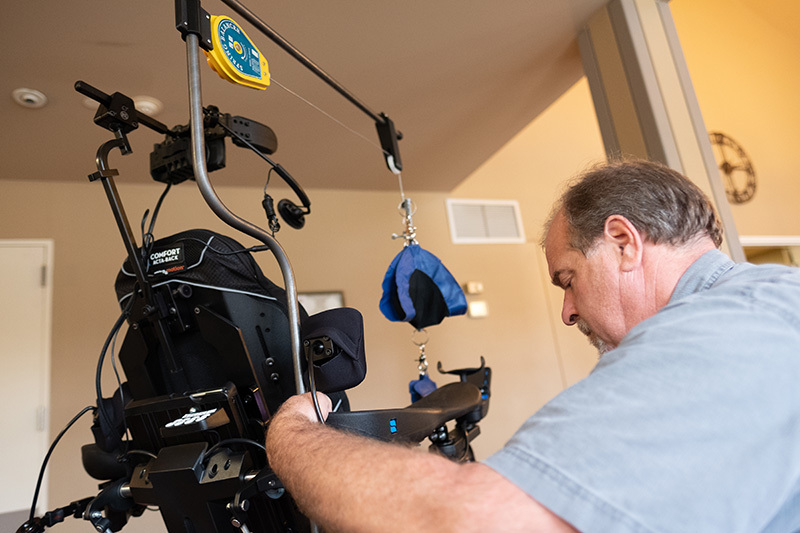 Vocational Rehab Training | While recovering from a spinal cord injury, Shane Hultine enhanced his skill set through vocational rehab training in the Biomechanics Research Building. Photo credit: Jon Pearson, QLI. Coordinator of PT/OT Services and Physical Therapist, Brad Dexter, is one of the Biomechanics team’s main partners at QLI. As Dexter became aware of the tremendous resources and expertise in the BRB, he suggested another initiative to help engage QLI residents with backgrounds in engineering and manufacturing: vocational rehabilitation training. The BRB has welcomed five QLI residents over the past year who supplemented their traditional therapy with vocational rehab training. Participants visited 2-3 times a week, accompanied by a therapist, and their tasks included guided work with Vanderheyden in the machine shop on computer aided design (CAD), microcontroller programming, electrical circuit design, and physical fabrication. "Through this initiative, the Machining and Prototyping Core provides an environment for QLI residents who have industrial or engineering backgrounds. These individuals gained new experience and honed existing skills to help them acclimate back into the workforce after their injury," explains Dr. Knarr. A few weeks into his 4-month residency at QLI for a spinal cord injury, Shane Hultine started vocational rehab therapy at the BRB. His therapist knew of Hultine’s industrial engineering degree and suggested CAD training to supplement traditional rehab. "It was a place where I could apply my skills in a work-like setting. It was a more authentic experience than physical therapy, and my first 'real life' activity outside of physical rehabilitation," says Hultine. "Previously, I was an assistant manager at a production plant, and I had a maintenance role. I’d crawl into the machine and troubleshoot it, but I’m not able to do that now. Now I’m on the design end." After graduating from QLI in late 2017, Hultine moved back to Illinois, but has since returned to Omaha. He plans to look for a job in the CAD field but wants to gain more experience first. In early Oct., he returned to the BRB as a volunteer. "It will keep me up on the different software and methods for rapid prototyping." After suffering a traumatic brain injury from an industrial accident, Jeff McEvoy spent five months at QLI, and is currently in outpatient treatment. He is also back to work part-time at his employer for over 20 years, a bearing factory in Atlantic, Iowa. Like Hultine, he has an engineering degree and came to the BRB for vocational rehab training a few weeks into his rehab at QLI. "It really helped me to get back to work," says McEvoy, who builds tools and machine parts with a computer-controlled mill and lathe and makes repairs to the factory production line. "After the accident, my recall was difficult—designing a part, the names of things. Vocational rehab at the BRB helped bring that back." McEvoy continues, "I loved the UNO part of my therapy. The technology at the BRB was amazing, and I was impressed with their engineering projects. Travis was really easy to talk to and work with—he did whatever it took for me to understand. And I did whatever I could to stick around!" Dexter is enthusiastic about the partnership and looks forward to what the future holds, "Travis and Brian have been great partners to QLI over the last several years. We appreciate their enthusiasm, creativity, and willingness to jump in to help find a solution to everyday problems that exist in our world of rehabilitation. Thanks to our collaborative relationship the devices that we’ve been able to produce with the help of UNO’s Biomechanics research team have enabled the individuals we serve to access their environment more independently, have given them a new sense of freedom, or, in some cases, have provided them additional safety. We’re looking forward to continuing to work with UNO’s Department of Biomechanics to help make some of our ideas reality!"